Outdoor curtains are undoubtedly an elegant way to protect an exterior space and can double as a privacy solution. 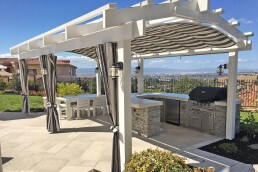 ShadeFX facilitated this must-have accent by pre-engineering curtain tracks into their custom aluminum structure. This new feature now gives clients the option of adding extended shelter while enhancing the ambience of their outdoor space. Surrounded by the Great Lakes, London, Ontario has its fair share of seasonal contrast. In summary, the city experiences long bitter winters and short sweltering summers. To take advantage of the Canadian summers and to dine al fresco rain or shine, ShadeFX confidently provided a turnkey solution. 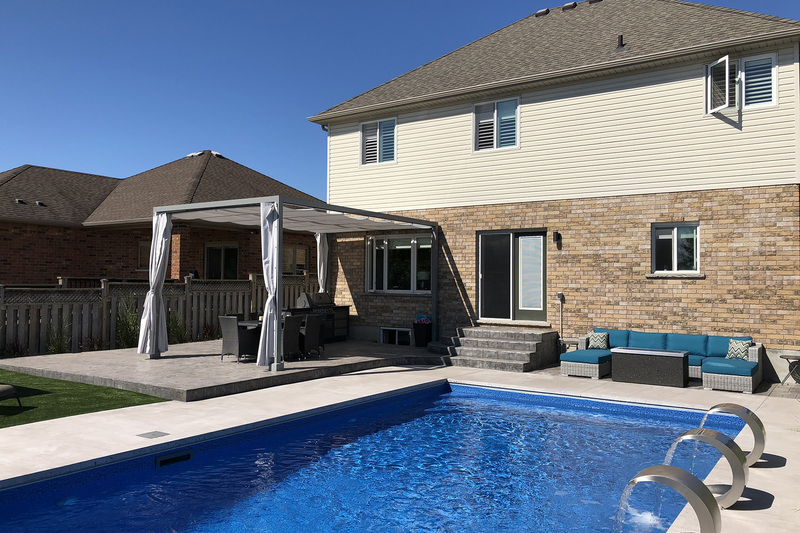 These homeowners benefited from the custom structure seeing that it dressed up their patio and provided a weatherproof retreat. 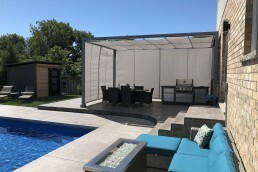 ShadeFX tailored the structure to their design with functional and durable options. 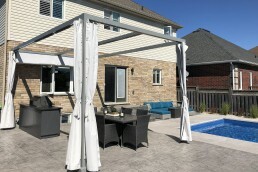 The ShadeFX service team installed an 18’ x 12’ aluminum structure which the homeowners powder coated a versatile grey. Two outdoor curtains were also integrated using the Sunbrella fabric. 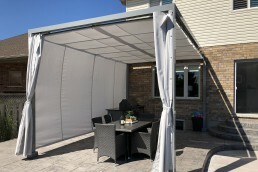 This premium watertight fabric blocks majority of UV rays and is resistant to mold and mildew. 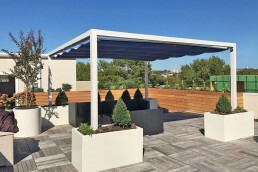 The manual underside canopy was specified using the same fabric as the curtains in order to match their timeless colour scheme. 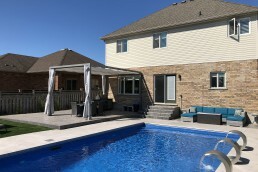 The homeowners veered from the standard application and fancied a double manual retractable canopy. 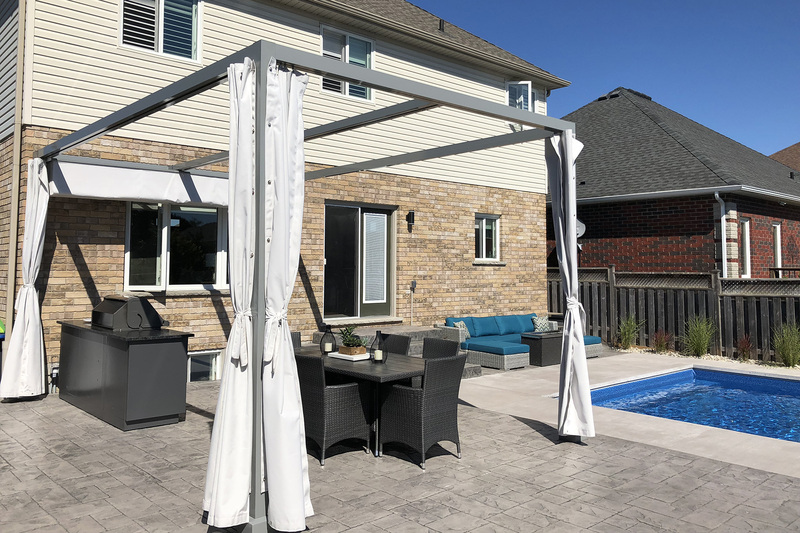 This flexible option allows the canopy to be retracted from either side of the single-track system without compromising the ease of deployment. 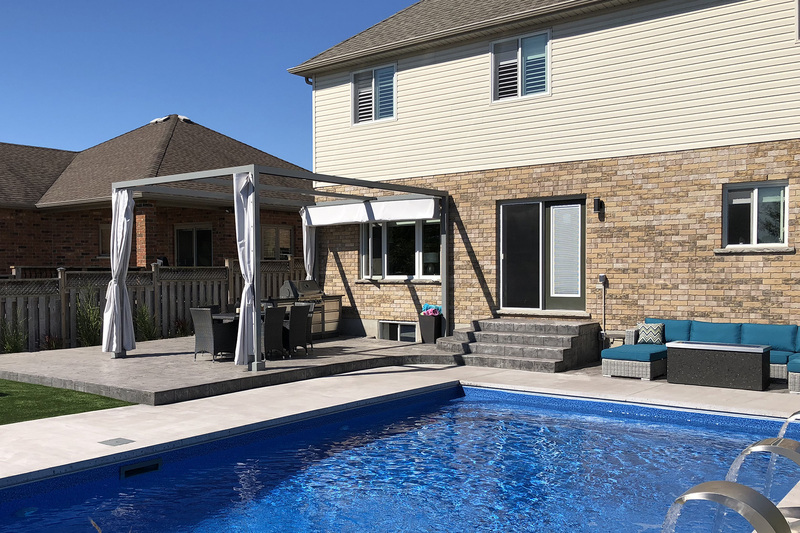 This home’s backyard is a natural Canadian summer haven. 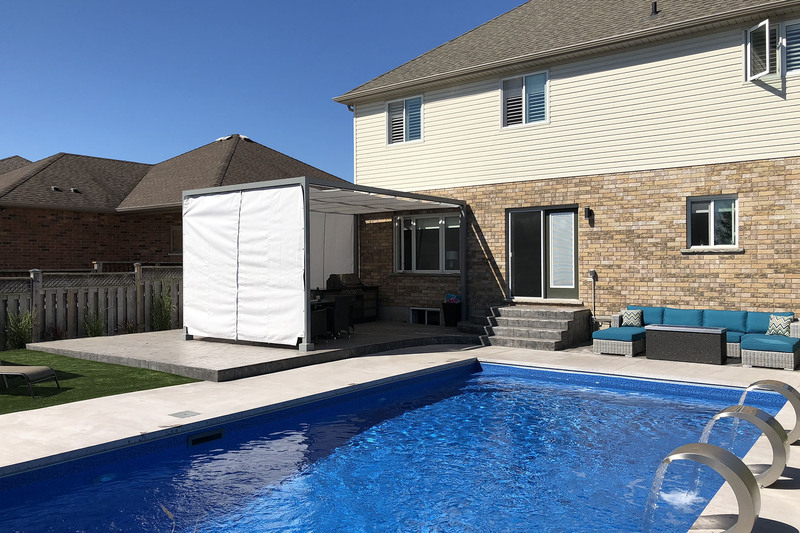 It provides the possibilities of plunging into the pool on those sizzling afternoons or tucking away from the unpredictable weather. 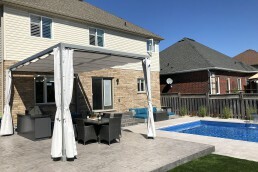 Furthermore, the addition of outdoor curtains to this dining space is a multi-functional embellishment. 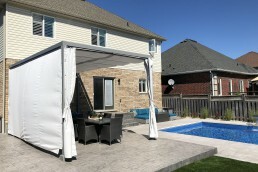 It has created privacy to set the mood, hindering the afternoon sun and shielding against the watery elements. Fancy adding versatile curtains to your structure? Let us know. 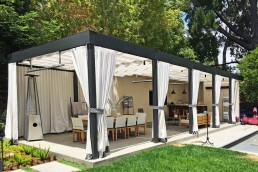 ShadeFX pre-engineered curtain tracks into the custom aluminum structure. 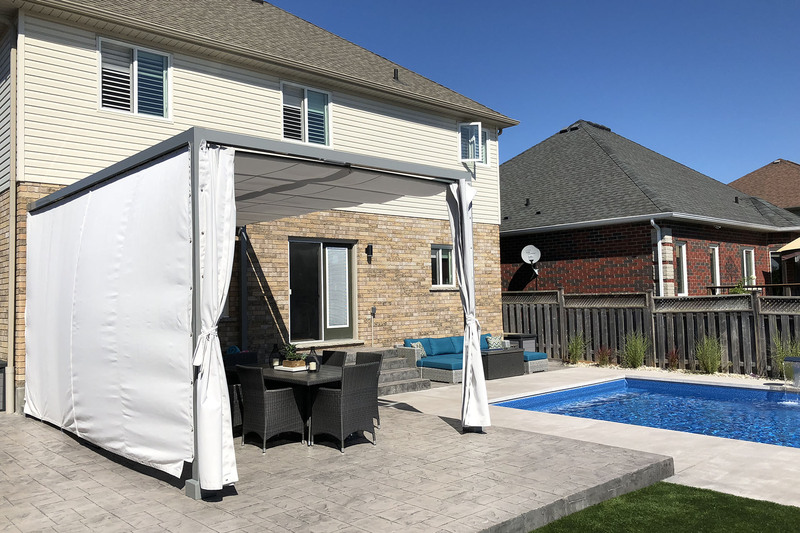 The addition of two outdoor curtains, in a matching sunbrella fabric, provide the homeowners with a multifunctional, weatherproof space.